I have stayed at this location many times. It is a great place for the price. The location of the hotel was great; we needed to be close to mad Anderson cancer center. The staff was very friendly and helpful. The grounds are nice, neat and attractive. We were given a room early, before check in time, but the only room available was a smoking room, which we decided to take. This probably accounts for the unpleasant smell of the room. The room was basic, but did have a small kitchen. I would describe the condition of the room as shabby. You pay extra for housekeeping if you stay less than a week. Very good location. Felt safe. Nice grounds. I would recommend this hotel to anyone who is staying in town who likes to cook for themselves. Well stocked kitchenettes work well. The hotel is right on the metro rail line, very convenient. Very quiet. No car needed. Kitchenette is very nice. No restaurants or within 6 blocks. Must pick up food for kitchen. Homestead Houston Medical Center is a specialized hotel designed for those who plan to stay at a lodging place for longer durations. Set in one of the most picturesque parts of town, surrounded by trees and exquisitely maintained gardens, the hotel on Fannin Street serves as a retreat to outpatients and a lodging place to medical professionals. Homestead Houston Medical Center offers a free shuttle service to Medical Center making the commute a lot easier. This is a pet friendly hotel but only one pet can stay per guest room. Rooms boast full kitchens with stovetops, microwave ovens, refrigerators, cooking ware and dining utensils. Bedroom areas in these studio suites feature comfortable beds, soft pillows, and premium linens and comforters. Guests at Homestead Houston Medical Center enjoy personalized voice mail services, off-site access to a fitness club near the area, free shuttle service to Medical Center, guest laundry services and wireless internet access. Since this is not a full service hotel, Homestead Houston does not have the usual hotel amenities but it does boast beautiful exteriors, a spacious frontage filled with small plants and trees. This hotel is not a typical lodging choice. Catering to a special niche, the Homestead Houston has limited itself to providing suite studio rooms with kitchens. 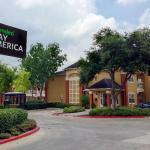 There is no fitness club on-site, no restaurant or bar and definitely no swimming pool but since it usually caters to outpatients of the Medical Center, hotel management has found it useless to add hotel-like amenities to the Homestead Houston. Overall, the lodging place offers a wonderful experience because the place is literally spotless and the hotel personnel are very professional with their duties. Parking: No, there is no parking available.